While the season 5 of Game of Thrones avenged some deaths, it ends with a gruesome murder that gave GoT fans some sleepless nights. Season 4 of Game of Thrones was a sigh of relief for all the fans who have been sitting in angst after the red wedding. Avenging the death of the Starks, the Purple Wedding was a surprise many fans wanted from Geroge RR Martin. But the wedding divided the Lannisters internally, turning them against Tyrion. Also in season 4, the Mountain and the Viper have a deadly and eye-popping trial by combat. On the other hand, Daenerys is expanding her army by bringing order to Slaver's Bay and pronounces herself as the queen in Meereen. While the fight for the Iron Throne takes a backseat, the major characters realise that there are internal wars to be dealt before they prepare themselves for the greater wars to come. The audience is also introduced to a religious group called Sparrows and a new known as the Sons of Harpy. While the season will avenge some deaths, it ends with a gruesome murder that gave GoT fans some sleepless nights. With just a few weeks remaining for the next and final season of Game of Thrones, season 8, take a quick guide on what has happened in the show so far one season at a time. Here's the recap of Game of Thrones Season 5. The episode takes us back to Cersei's teenage days when she learns a prophecy about herself saying, that someone younger and more beautiful than her will one day take away all her accomplishments. the first episode also introduces Sparrows, a devoted religious extremist group. Far away from King's Landing, Tyrion agrees to go with Varys and support Daenerys for claiming the Iron Throne. At the Wall, Stannis wants to the Wildlings in his war against Roose while Jon Snow is unable to convince Ryder to accept Stannis's authority. Arya Stark arrives in Braavos and is accepted into the "House of Black and White" by H'ghar, who is widely known as "no one". Podrick and Brienne meet Baelish and Sansa in a tavern and keeping her promise to Catelyn, Brienne offers Sansa her protection. But Sansa refuses it. Stannis tries to strike a deal with Jon promising him the lordship of Winterfell if he leaves the Night's Watch to help him, but like Sansa, he also declines the offer. By the casting vote of Aemon, Tarly is elected as the Lord Commander of Night's Watch. On the other hand, Daenerys comes across a riot subsequent to her decision to execute a former slave who assassinated a member of the Sons of the Harpy. Margaery manipulates Tommen to send Cersei to Casterly Rock while Baelish takes Sansa to Winterfell to make an alliance with Roose by getting her married to Ramsay. In Braavos, Arya is asked to discard all her belongings to adapt in the House of Black and White. At Castle Black, Snow names Thorne First Ranger, but Slynt refuses to follow Snow's orders who is executed by Snow. Lancel who has just joined the Sparrows finds the High Septon in a compromising situation in a brothel and the latter is forced to take the walk of shame. Tyrion and Varys arrive in Volantis and the former is kidnapped by Mormont, who intends to take him to Daenerys. With the help of Cersei, the Sparrows arrest Margery brother Loras. At the Wall Melisandre tries to seduce Snow trying to convince him to go to Winterfell with Stannis. Bronn and Jaime secretly land in Dorne for his daughter Myrcella. Ellaria sways in the Sand Snakes to avenge the death of Oberyn by abducting Myrcella before Jaime comes for her. Mormont plans to trade in himself to Daenerys by giving Tyrion as a prisoner. In Meereen, Loraq makes another appeal to her to reopen the fighting pits and the Sons of the Harpy carry out a surprise attack on an Unsullied patrol inside the citadel. Brienne and Podrick reach Winterfell and send Sansa a message stating that they will help her if need be. At the Wall, Tormund accepts Night's Watch alliance with the Wildlings to settle south of the Wall. Jon Snow agrees to accompany him to meet the Wildlings in Hardhome. In Meereen, Grey Worm builds up his strength and is falling for Missandei. Daenerys executes a Meereenese nobleman by feeding him to her dragons Viserion and Rhaegal and imprisons the others. She also decides to reopen the fighting pits and agrees to marry Loraq as a peace treaty. At sea, Tyrion and Mormont sail through Valyria, and are attacked by a group of stone men on their way. The three of them manage to escape, however, Mormont is infected with greyscale. In Braavos H'ghar escorts Arya to a chamber with the faces of all the people who lost their lives in the House of Black and White. Jaime and Bronn reach the Water Gardens and see Myrcella being attacked by the Sand Snakes. Baelish double crosses Sansa and informs Cersei of Roose's plan to marry the Stark daughter to Ramsay, and manages to convince her to allow him to lead the Knights of the Vale to Winterfell to defeat the winning party of the conflict between Roose and Stannis, being named Warden of the North in return. Olenna arrives in King's Landing and warns Cersei that the captivity of Loras has put their alliance in a threat. At Loras' enquiry, Loras and Margaery both deny his homosexuality but a male prostitute contradicts their testimony, and Margaery is arrested for lying to the gods. In Winterfell, Sansa is wedded to Ramsay, who rapes her in front of a horror-struck Theon. Sansa asks Theon to help her escape Winterfell, instead, he informs Ramsay. At Stannis' army's camp, Melisandre proposes to sacrifice Shireen. Mormont and Tyrion are sold to slaver Qaggaz and the two are brought to a local fighting pit that Daenerys and her consort happen to visit. Defeating other slaves, Mormont reveals his identity to Daenerys and brings Tyrion as a "gift" for her. 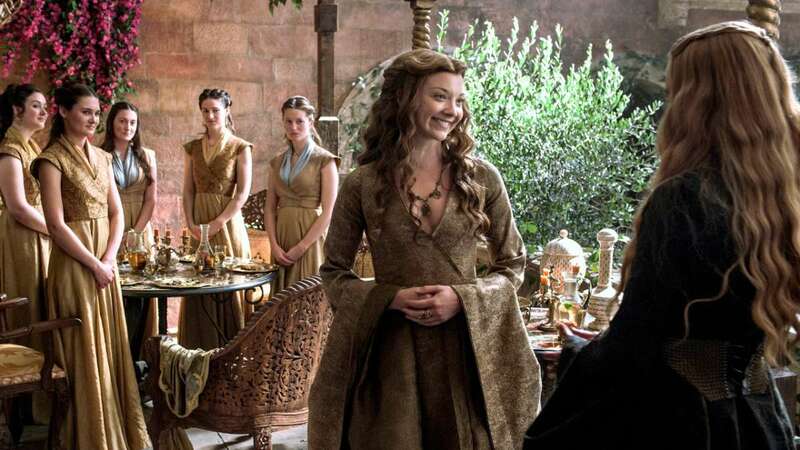 Olenna's request to release Loras and Margaery is declined by the High Sparrow and the High Sparrow arrests Cersei under the charges of an incestuous relationship with Lancel. 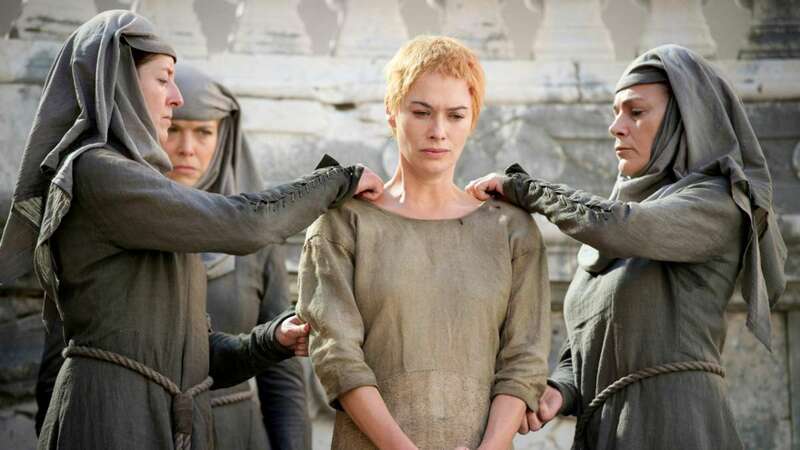 Cersei is tortured by the Sparrows to confess her incestuous relationship, but she refuses. is given a task by H'ghar to study a man who sells marine insurance, but has defrauded beneficiaries and poison him. In Winterfell, Theon confesses to Sansa that he faked the deaths of Brandon and Rickon while in Meereen, Daenerys accepts Tyrion into her council who convinces her to spare Mormont's life. At Hardhome, Snow and Tormund are attacked by an army of wights. Jon kills a White Walker with his Valyrian-steel sword. Jon accompanied by other Wildlings see the Night King resurrecting the dead wildlings as white walkers. After Stannis' army inflicts heavy losses at the hands of Ramsay's army, he reluctantly allows Melisandre to sacrifice Shireen by burning her alive at the stake. In Dorne, Doran allows Jaime and Bronn to go back to King's Landing with Myrcella, given that Trystane will accompany them and he will serve on the small council in Oberyn's stead. In Meereen, during a fight pit, Daenerys and her party are surrounded by the Sons of the Harpy. But to everybody's surprise, Drogon arrives and in a dramatic move, the queen flies away from the pit. Shireen's sacrifice leads to Selyse's suicide and half of Stannis' forces leaves him. Melisandre also flees to Castle Black, and Stannis has to accept defeat at the hand of the Boltons. He is later killed by Brienne. In order to escape from the Sparrows, Cersei admits her former relationship with Lancel and is forced to face atonement by walking the streets fully naked. As she reaches the Red Keep, Qyburn brings in a new member of the Kingsguard to her. Jaime, Myrcella, Bronn and Trystane set their sail from Dorne but Myrcella dies of poison soon after they board the ship. Disobey the rules of the Faceless Men, Arya breaks into a brothel to kill Trant and a result she is blinded as a punishment. In Meereen, Daenerys is found by a large group of the Dothraki while at the Wall Snow is betrayed by his men and is stabbed several times leading to his death.